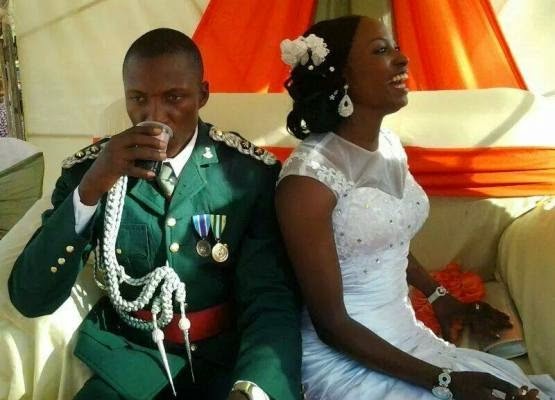 The Nigerian Army, has again, warned that the law prohibiting serving officers and soldiers from taking foreigners as spouses was still in place. It advised its person­nel, who had the intention of marrying foreigners to have a rethink or put in their notification of retirement. The Army said the law, which has been in existence since 1975, was enacted for security reasons. Acting director, Army Public Relations, Colonel Sani Usman, who made this known at a media brief­ing, yesterday said some dimissed soldiers took ad­vantage of the recent review set up by the Chief of Army Staff, Lieutenant General Yusuf Buratai, to review cases of personnel convict­ed by a general court mar­tial for offenses committed while on counter insurgency operation in the North east to appear before the review committee. Colonel Usman, who de­scribed the dismissed per­sonnel as miscreants and criminals, said their cases were out rightly rejected by the review committee. Taleo my man, how are you dey? Make I giving you ezampul. If they are marry to persin wey from Ghana or Stella Lone and Nigeria is fighted war with them, the soja man wife go also fighted war with the soja. Is no good nah. Our army dey wise. eeeiii oh okay, I see, so that is why my 5 years old relationship is still pending, eeeeiii Nigeria this is not fair at all, am in a serious relationship with a niaja soldier, he has come for introduction, but he is been quite for a year after the introductory. hmmmmm I see so that is why, Mr president is expected to visit Ghana this morning, I wish am a journalist like I will like to ask him just one questions regarding this matter. Bench, u no deh dull at all I blive u scata.